In this presentation, Marc Lankhorst talks you through the history and development of ArchiMate, as he was involved in this success story from the very beginning. Marc explains its background, goals and principles, and shares some success stories. He will also show how you can facilitate strategy implementation by relating strategic discussions on business models (e.g. using Alexander Osterwalder�s Business Model Canvas) to enterprise architecture designs. 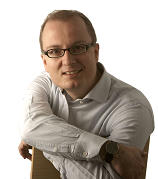 Marc Lankhorst managed the development of the enterprise architecture modelling language ArchiMate at the Telematica Instituut (later called Novay), in cooperation with representatives from government, industry and academia. Like TOGAF, ArchiMate is now an Open Group Standard. To show and discuss how ArchiMate is used in companies today, we have invited Brechtel Dero, Head of the Department IT Architecture of the Colruyt Group, to bring a customer testimonial. The Colruyt Group is a prime example of process thinking. The business and IT architecture disciplines at Colruyt have become much more mature due to a more formal approach to enterprise architecture and solution architecture, and thanks to a pragmatic but effective architecture governance at both project and board level. This evening event is free of charge, but registration is required. Also, we expect registered participants to have the courtesy to show up at the event or let us know in advance that they can not make it so that we can allow others on the waiting list to participate. ArchiMate and TOGAF are registered trademarks of The Open Group.